The label got me. Yes, I admit it. I had to buy this wine as soon as I saw it. I am a Pink Floyd fan. Can you tell by the boxed CD set? The music is the soundtrack to a lot of great memories over many, many years. My first Pink Floyd album was “The Wall” released in 1979 back in the dark ages before CD’s. I cannot tell you how many times I listened to it over and over again. I saved up my allowance and I purchased “Wish You Were Here” and, of course, “The Dark Side of the Moon”. My collection did not end there and grew with each later release. I decided to open the bottle on a cold, cloudy, and misty day. It was just like the day we went with a group of friends to a outdoor Pink Floyd concert. What a fun filled evening it was even with the crappy weather. Friends, music, laughter, and more laughter (like tears running down your face because you are laughing so hard). It is one of those events I wish I could go back in time to enjoy again. 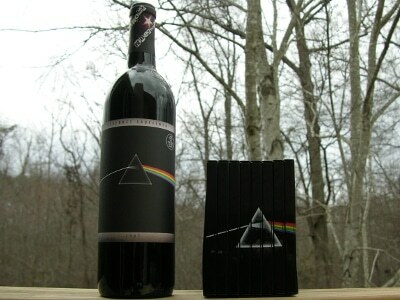 Pink Floyd The Dark Side of the Moon Cabernet Sauvignon 2007 is one of the wines in the “Wines that Rock” lineup. It is produced and bottled by Mendocino Wine Company in California. It has flavors of cherries, dark currant, and vanilla. This is an everyday kind of cabernet with a bit more of a smooth quality than typical robust cabs. It sells for around $15. If you are a Pink Floyd fan then I recommend getting a bottle and enjoying it while listening to The Dark Side of the Moon. Pair up the wine with music and perhaps a nice hearty beef dish also. Have you purchased a wine just because of the label? Or is that how you decide on which new wines to purchase? Amazing how art, design, and music can influence and play such a big part in so many aspects of our lives including which products we purchase. Cheers! I found it at a World Market store (Cost Plus World Market). Perhaps there is one in your area. You could probably find it online also. I know a number of people who are influenced by packaging, regardless of wine or widgets. I try to go by the quality of the product, however. I hope it was a good wine. It was good. I would buy it as a gift for someone who is a Pink Floyd fan and a wine lover. Unfortunately, I almost always buy a wine because of the label. I have been pleasantly surprised sometimes, but not always. I would definitely buy this, and I have someone in mind who would just love this. At least you are trying new wines and that is a good thing! So keep looking at the labels and make notes on what you like about the ones you try. It will help in your future purchases.